My childhood dog, Abbey, as if she was a Sailor Scout like we'd expect to find from Sailor Moon. Her color pattern on her Sailor Scout uniform was based on her fur in real life and I added angel wings because she had a kind loving personality of an angel and passed away 10 years ago this past mid-fall of old age and a spleen tumor put together, and finally went to heaven shortly afterwards which the background behind her human form was based on, and that's just my family's camper trailer behind her real life doggy form. I want to credit the people labeled on the bottom right corner of the left picture for creating the program that allows us to create our own Sailor Scouts any way we want. 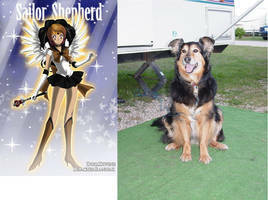 Her Sailor Scout name "Sailor Shepherd" was named after one of her two breeds she was mixed with which was "Australian Shepherd" along with "Border Collie," even if "Abbey" was just her real name. R.I.P. Abbey, we miss you, but still love you very much with all our hearts! Sailor Moon belongs to Naoko Takeuchi. Abbey belonged to me and my family back in my childhood. You mean Luna the Cat as a human Sailor Scout? Because I looked in your gallery to see a star on a sketch you drew of her, and thought I added that to favorites. And that reminded me, I happen to have a split-screen comparison of my childhood dog, Abbey, as a human Sailor Scout: And then, sometime after that was uploaded, my friend Mene surprised me with this sketch of her: Unfortunately, she died years ago of a spleen tumor and old age put together, so why not have wings added to her? Still, just the same, her leotard was white like the ones of the other Sailor Scouts, but everything else was colored after her fur from real life. As for Luna, her bows and skirt might be yellow because her dress on her human form from other images was yellow, yet all her fur from her kitty form was black. The fur of Abbey was mostly black with a some brown on her legs, upper chest, and face. I added blackness to her skirt and V-collar but her boots and bows had brownness to match the color pattern on her real life fur coat, but I credit you on Luna the Cat as a Sailor Scout. I wish dogs and cats can live as long as we can and turn into humans, but none of those can happen in real life, so a short length of time for dogs and cats is something we need to accept whether we want to or not. But I still miss Abbey very badly. She was very important to my life, and I knew she was going to be gone one day, so I enjoyed part of my life with her as best as I could until the sad day came and went. But as soon as I die and go to heaven like her, we'll be together again, and forever. You're welcome, but I don't remember what I added to favorites. Oh yes. 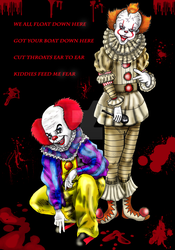 Pennywise is funny! Oh I know what, how about the Sailor Scout style of the female 1990 Pennywise? White leotard, yellow skirt and V-collar, orange bows under the V-collar and behind the shirt, orange buttons, black high heel shoes, white sleeve gloves with orange sleeves, gold tiara with an orange gem, goofy red hair, goofy make-up, sharp teeth of a shark, and a big set of balloons? That's the clownsuit I'm describing with the design based on Sailor Moon and colors based on 1990's IT. So, have you read my IT fanfics? No, I just looked at the sketches. But what's wrong with Sailor Moon? You're welcome, but what was it again?